The bag (pictured) was used by Neil Armstrong to collect moon rocks. 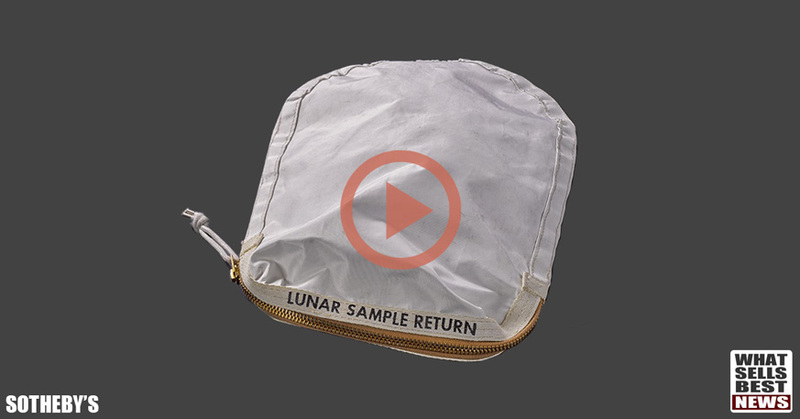 NEW YORK (VIDEO) – A NASA moon bag, mistakenly sold to a Chicago woman for $955 in a government sale, has fetched $1.8 million at auction. Prior to the auction the woman sent the 12 by 8½ inch bag to NASA for authentication. However, getting it back after they authenticated it, was not easy. She had to win a custody battle to get the bag returned. The bag played an important role in the Apollo 11 Spaceflight which landed the first men on the moon, in July of 1969. A mission that required Neil Armstrong and Buzz Aldrin to collect and return moon rock samples. Six hours after landing the Apollo Lunar Module on the moon, Armstrong became the first man to step onto the moon. Aldrin followed 20 minutes later. The 'moon bag' was used to collect rocks and soil from the lunar surface. The battle for the moon bag is not the first time NASA's been in a legal tussle over space memorabilia. In 2011 they sued astronaut Edgar Mitchell for trying to auction a camera used on the Apollo 14 mission. Then, in a clear cut case of wrongdoing. A former NASA employee, tried to impress a girl by stealing $21 million in moon rocks. He wheeled them right out the door with a hand-truck. While NASA may not always gain sympathy in the court of public opinion. It's understandable how they could get a bit edgy, trying to preserve our national treasures. Using our free collectible price research page, I found high-prices for a wide variety of rare space items. Particularly items early in space history, or flown to the moon. SOLD (VIDEO) - $2.9 Million for a 1961 Soviet Space Capsule at Sotheby's in April of 2011. SOLD (VIDEO) - $1.6 Million for Watch Worn on Moon at RR Auctions in October of 2015. SOLD (VIDEO) - $1.3 Million for 1970s Soviet Space Capsule at Lempertz in May of 2014. SOLD (VIDEO) - $760,000 for NASA Moon Mission Camera at Westlicht in March of 2014. SOLD (VIDEO) - $453,281 for Camera Lens Used on Apollo 15 at RR Auctions in April of 2016. The NASA bag featured in this story was sold in New York on July 20, 2017, by Sotheby's. You can see more at Sotheby's website where the Moon Bag is listed as lot number 102. See if you can spot a bargain among NASA items listed on ebay (research prices). Also see; Top 25: Historical Collectibles on ebay, worldwide, right now (links open on ebay).